Yet despite almost 10 years at the State Department, a relevant education for foreign affairs work, a proven ability to work at multiple diplomatic missions abroad including a hardship post, experience as a desk officer, and a passing mark on the written exam, she is told she is not qualified to take the orals? When I asked the director general’s office what she would have to do to qualify, the response was “We don’t know” and “The board makes the decisions,” as though no department official is responsible for the board’s creation, operations or results. 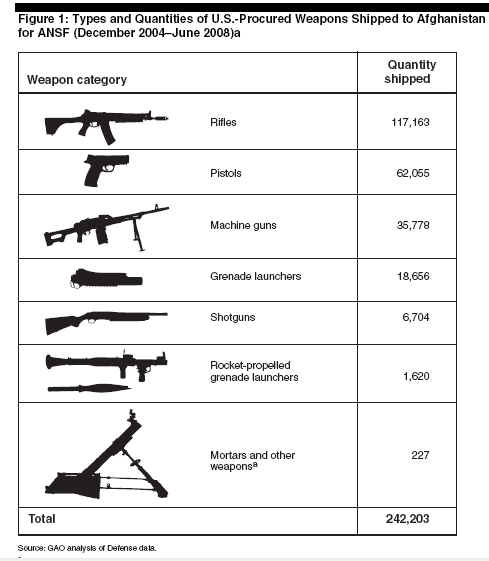 GAO: We found that the U.S. Army and CSTC-A did not maintain complete records for an estimated 87,000—or about 36 percent—of the 242,000 weapons Defense procured and shipped to Afghanistan for ANSF. Lack of functioning property book operations. Many Afghan army and police units did not properly maintain property books, which are fundamental tools used to establish equipment accountability and are required by Afghan ministerial decrees. Illiteracy. Widespread illiteracy among Afghan army and police personnel substantially impaired equipment accountability. Poor security. Some Afghan National Police units did not have facilities adequate to ensure the physical security of weapons and protect them against theft in a high-risk environment. Unclear guidance. Afghan government logistics policies were not always clear to Afghan army and police property managers […] logistics officers often carried out property accountability functions using Soviet-style accounting methods and that the Ministry was still auditing army accounts against those defunct standards. Corruption. Reports of alleged theft and unauthorized resale of weapons are common, including one case in which an Afghan police battalion commander in one province was allegedly selling weapons to enemy forces. Desertion. Desertion in the Afghan National Police has also resulted in the loss of weapons. One of the examples cited by the GAO report refers to night vision devices: In July 2007, Defense began issuing night vision devices to the Afghan National Army. These devices are considered dangerous to the public and U.S. forces in the wrong hands, and Defense guidance calls for intensive monitoring of their use, including tracking by serial number. However, we found that CSTC-A did not begin monitoring the use of these sensitive devices until October 2008—about 15 months after issuing them. […] After we brought this to CSTC-A’s attention, it conducted an inventory and reported in December 2008 that all but 10 of the 2,410 night vision devices issued had been accounted for. I was recently able to purchase a U.S. military laptop for $650 from a small kiosk, which is known as the “Sitara Market,” on the western edge of the sprawling open-air markets on the edge of Peshawar. […] The laptop, which has clear U.S. military markings and serial numbers, contained restricted U.S. military information, as well as software for military platforms, the identities of numerous military personnel and information about weaknesses and flaws in American military vehicles being employed in the war in Afghanistan. The GAO made several recommendations in its report to help improve accountability for weapons and other sensitive equipment that the United States provided to ANSF. As talks about a military surge in Afghanistan becomes louder, this also becomes more crucial – the weapons targeting our troops there may no longer just be remnants from the Soviet-Afghan war, but procured and paid for by the U.S.A. Links to the reports below in pdf files.